More echoes of 1968? During the past week there has been a wave of protests in Brazil, beginning with relatively small-scale incidents São Paulo that escalated into massive demonstrations there and in other cities across the country. At first I thought it was curious, given Brazil's size and importance, that they didn't seem to be getting a lot of attention in the US, by comparison with the protest wave in Turkey. But whether or not that impression was correct at the beginning, this unexpected upheaval in Brazil is certainly getting increasing international attention as time goes on, including prominent coverage in the New York Times here and here. Protesters showed up by the thousands in Brazil’s largest cities on Monday night in a remarkable display of strength for an agitation that had begun with small protests against bus-fare increases, then evolved into a broader movement by groups and individuals irate over a range of issues including the country’s high cost of living and lavish new stadium projects. 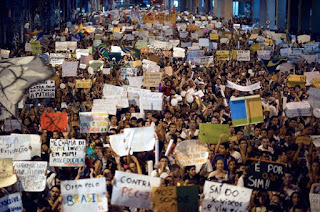 The growing protests rank among the largest and most resonant since the nation’s military dictatorship ended in 1985, with demonstrators numbering into the tens of thousands gathered here in São Paulo, Brazil’s largest city, and other large protests unfolding in cities like Rio de Janeiro, Salvador, Curitiba, Belém and Brasília, the capital, where marchers made their way to the roof of Congress. Such broad protests are relatively uncommon in Brazil, with some Brazilian political analysts describing what appeared to be a political culture more accepting of longstanding high levels of inequality and substandard public services than citizens in some neighboring countries in South America. Police and protesters fought in the streets into the early hours Friday as an estimated 1 million Brazilians swarmed through more than 80 Brazilian cities in the biggest demonstrations yet against a government viewed as corrupt at all levels and unresponsive to its people. President Dilma Rousseff called an emergency meeting of her top Cabinet members for Friday morning, more than a week after the protests began. Rousseff, who has a standoffish governing style, has been almost entirely absent from the public eye, making only one statement earlier in the week that peaceful protests are part of the democratic process. => On Wednesday I was among those who received some e-mailed reflections on the protest wave in Brazil from Fernanda Dobal, a Brazilian former student of mine who is currently living and working in New York City. Her reactions are a little complicated, but so far she finds what is happening in Brazil right now inspiring. Fernanda agreed to guest-post her thoughts here, so you can read them below. Last Thursday, a protest of an estimated 10,000 became violent when riot police turned on the crowd with tear gas, pepper spray, and rubber bullets. A journalist was shot in the eye. Another was potentially blinded, and a third report (not covered by the media, but from a friend back home), is that a girl died. It has recently been shared between unofficial Brazilian channels that the gas explosives were long expired, making them more toxic than they should be. This is a small but poignant example of the inadequacies exhibited by the executive branch. In Rio, some of the protests again turned violent, resulting in unnecessary vandalism. In Brasília, people marched on the capital and literally climbed onto the Congress building, but the movement remained peaceful. In New York, we did our small part by supporting with a group of about 200 in Union Square. Demonstrations in capital cities around the world have shown similar support. Today, some protests continue, albeit less peacefully than yesterday's. It is hard to say exactly what will happen moving forward. As the causes fight for attention and people split with their interests, momentum suffers. Some people are riding this as a fad, and some politicians are using it to look good (including President Dilma, who has "embraced" the protests and grievances against her government in international media), and of course, the local media outlets distort according to their individual agendas. Nonetheless, the force present is undeniable, and many of my compatriots feel pride for the unity that has transpired. You have probably heard me say at some points that I don't see myself returning to live in Brazil. That's because I never expected things to change (and part of me remains quite cynical), but hope for the possibility of change has not manifested itself in such a big way as far as I can remember. I think it is this hope that is behind much of what is happening. I urge you to stay tuned, because as citizens of the world this is relevant. So much has been said about social media, but we really are experiencing something new, and it is fascinating. ps: If you want more information, the NYT blog has assembled a series of interesting videos on the topic, including news coverage, interviews, and video logs. Here.